The Lexicon JamMan is a small rack-mount unit that allows me to record live with a tap of a foot pedal. When the pedal is tapped again, it immediately plays back the recorded "sample" in looping form. This makes it possible to play as an ensemble by yourself. You can lay down any repetitive type chord progression or bass pattern and improvise until the cows come home. You may also record additional parts to your loop. The manual suggests a maximum of 8 layers but I have a composition where I end up with 13 or 14 recorded parts with no problem. It comes stock with 8 seconds of memory but is easily upgradable to 32 seconds. (mine has been upgraded) Although the JamMan is no longer produced, it may be possible to find one for sale. There are other comparable looping boxes available such as the Oberheim Echoplex and the Boomerang. For much more information and ways to use this type of device visit the Loopers Delight. pages. The Midi Control unit is an ART X-11. I use it to call up various strengths of reverb on my DigiTech 128 effects processor. The reason I have placed the volume pedal (an old Morley VOL model) last in the chain is that there, it allows me to manually fade out compositions made with the JamMan. The guitar used above is one of my handmade fingerstyle guitars. It is a 12-fret cutaway designed and built for silk'n'bronze strings. 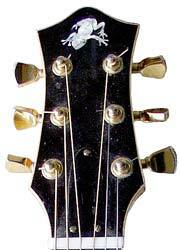 It has an L.R.Baggs older style "dual source" pickup system.